Riker Lawrence ’21 discusses her experience presenting at the Mid-Atlantic Undergraduate Research Conference below. Attending the Mid-Atlantic Undergraduate Research Conference last weekend was an interesting experience for me. In the past, I have attended conferences that mainly focused on behavioral science. This conference included multiple different fields of research, so I learned many new concepts in fields such as physics, wood science, and chemistry. I enjoyed learning about information that I wouldn’t normally research on in my specific field. My poster presentation focused on Psychological Capital (PsyCap) and workplace attitudes. Specifically, my lab mate and I examined associations between PsyCap, well-being, and how employees write about their jobs. We also explored the usefulness of Maslow’s (1943) Hierarchy of Needs in coding participants’ writings about their jobs, because his theory can be used to explain human needs. Overall, I thought the conference was well organized and provided a good research experience to undergraduates. Congratulations to Lawrence for her successful presentation on Psychological Capital and workplace attitudes! The psychology department would like to congratulate Noelle Warfford ’19 on her acceptance to The University of Toldeo’s Clinical Psychology PhD program! Recently I received an offer of admission to The University of Toledo’s Clinical Psychology PhD program to work with Dr. Joni Mihura. Since this had been my top choice school, I happily accepted. I’ll start this fall, and I’ll be doing research on developing a short form of the Rorschach-Performance Assessment System to assess for thought disorder in first-episode psychosis. Congratulations to Aislinn Foutz ’19 for her successful Honors in the Major and Honors Distinction Project defense last semester! Her project was titled “Parental and Peer Factors in Children’s Theory of Mind Development” and Dr. Findley-Van Nostrand was her advisor. Foutz is now working towards building off of this work and applying to graduate programs to continue studying Theory of Mind. She also has a presentation under review to present this work at the Society for Research on Child Development in the Spring. For my Honors in the Major/Distinction Project, I collected parent-reports of children’s theory of mind and various other parental and peer/social variables and found a number of significant associations. For instance, theory of mind was positively associated with variables such as parental willingness to serve as an attachment figure, closeness in parent-child relationships, mind-mindedness, and pro-social behavior, whereas theory of mind was negatively associated with conflict in parent-child relationships and various peer difficulties (e.g., peer problems). Follow-up analyses revealed child age, closeness, and mind-mindedness seem to be especially important to children’s theory of mind development, and that, although these associations were significant throughout early, middle, and late childhood, the closeness-theory of mind relationship was strongest in early childhood. I am aiming to extend this research in several ways, primarily by examining how various sub-types of theory of mind (e.g., belief and desire) may relate differently to these parental and peer factors. Dr. Findley-Van Nostrand was my research mentor for this project and working with her was a great experience. Whenever I needed help, she was always readily available. She also helped me sharpen my research skills while challenging me to learn new ones. Although I was nervous for my defense, I was also excited for the opportunity to share my research. Successfully defending my distinction/honors in the major project was a rewarding experience, and now I’m looking forward to continuing to extend this research. Congratulations again to Aislinn Foutz ’19! Thank you for taking time to answer our questions! We look forward to seeing what you will accomplish in the future. New Majors Orientation in March! Four students recently attended New Majors Orientation where they were able to sign their names onto the psychology board and learn about different opportunities available as a psychology major. The orientation was led by Dr. Powell, who will be leading another orientation on April 5th at 5:00 pm in LS 502. New majors are required to attend orientation, so if you recently declared a major in psychology, please sign-up for the final orientation through SONA! Riker Lawrence ’20 (left) and Kaitlin Busse ’18 (right) presented two posters at the Academy of Human Resource Development conference in Richmond, VA, this past week..
Congratulations to Kaitlin Busse ’18 and Riker Lawrence ’20 for their successful poster sessions at the Academy of Human Resource Development (AHRD) Conference in Richmond, Virginia! 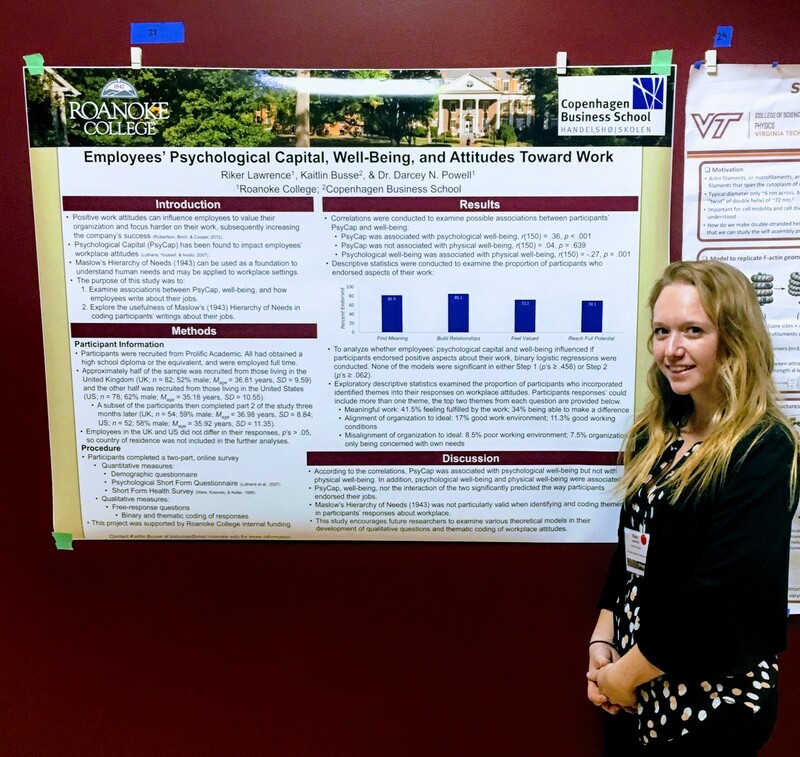 Part of Dr. Powell’s lab, Busse and Lawrence presented two posters on their findings from researching work-life balance and perceptions of organizational climate and job satisfaction in employees from the United States and the United Kingdom. Under the direction of Dr. Nichols, Ms. Stephanie M. Shields and Ms. Caitlin E. Morse conducted a study in order to see how the number of trials needed to collect enough data for Event-related Potential (ERP) could be minimized through the reduction of artifacts. Typically, this type of research requires a number of trials in order to collect enough data. Oftentimes, several of these trials have to be discarded as a result of artifacts, or errors. To read more about what they found as a result of their research, follow this link to the original article. Related: Ms. Shields was awarded a Fulbright grant to return to Germany to study bat vocalizations and vocal learning in Munich, Germany from September 2017-July 2018. Prior to this, she spent a summer in Hamburg, Germany through the German Academic Exchange Service Research Internship in Science and Engineering. While there, she completed a research project with Ph.D. student Signe Luisa Schneider on electroencephalography (EEG), learning, and memory. (To find out more about this latter project, follow this link.) Shields also completed over three years of research in the psychology department and had other articles published as well. She graduated with a major in psychology, a concentration in neuroscience, and a minor in German. She plans on earning a Ph.D. in Neuroscience. Related: Ms. Morse currently works as a Licensed Nursing Assistant at Portsmouth Regional Hospital in New Hampshire. Graduating from Roanoke College with a degree in Kinesiology and Exercise Science in 2017, she followed this by attending the Massachusetts College of Pharmacy and Health Sciences where she completed a Bachelor of Science degree in order to become a registered nurse. While at Roanoke College, she worked as a research assistant in the psychology department for around three and a half years, starting in 2013. She has also participated in two other published articles through Dr. Nichols lab, alongside Ms. Shields and other students. Her Linked In account can be found here.